The Sheriff’s Roundup is a behind the scenes wrap up of some of the incidents and events the Sheriff’s Office was involved with during the past quarter. In addition to showing some of the major incidents that have occurred, each episode features a different branch or aspect of the Sheriff’s Office. The Roundup also includes a Focus On Safety feature which provides safety tips for the public on a crime trend that we are seeing. The Roundup also typically features a Training Corner segment to show what deputies do to prepare for any scenario that comes their way. The Sheriff’s Roundup is a great way to see all that goes into keeping the public safe and the amazing work being done behind the scenes by the men and women of the Sheriff’s Office. 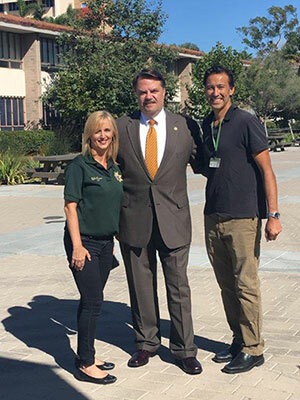 The Sheriff’s Roundup is put together each quarter by Public Information Officer Kelly Hoover and filmmaker Paul Westmacott, who has worked at the Sheriff’s Office as the Media Resource Specialist since 2009. Together, they decide what topics the public would be interested in seeing and what aspects of the Sheriff’s Office to highlight. Kelly writes the Roundup and Paul shoots and edits the segments of the show. The Roundup is narrated by Sheriff Brown and each episode is shot in various locations throughout Santa Barbara County. The Sheriff’s Roundup was historically an internal video and dates back more than 25 years. The monthly video was called “11-98” which is code for “Meet Here” and was used as a way to keep Sheriff’s Office employees apprised of what was happening at the many different divisions across Santa Barbara County and as a way to keep everyone on the same page. In addition to providing critical information to the employees, it also served as a morale booster by highlighting some of the great work being done by different individuals and groups within the department. In 2013 the decision was made to make the Sheriff’s Roundup public so the citizens could also see all that goes on at the Sheriff’s Office and the great work being done by the people who are dedicated to protecting and serving them. The Roundup can be viewed on our website. We have the last several years of episodes posted here for you to view. We also post the Roundup on our Facebook page. It can also be viewed on Santa Barbara County Television, Channel 20 and on Santa Maria Community Television Channel 25. We hope you enjoy watching and we always welcome your feedback and suggestions.